The symbol for the Universal Gas Constant is Ru= 8.314 J/mol.K (0.0831 bar dm3 mol-1 K-1). The Specific-Heat Capacity, C, is defined as the amount of heat required to raise the temperature by 1K per mole or per kg. The Specific Heat Capacity is measured and reported at constant pressure (Cp) or constant volume (Cv) conditions. For monoatomic gases Cp=2.5Ru J/mol.K and Cv=1.5Ru J/mol.K repectively. The ratio of the two specific heats is called the adiabatic ratio of the gas. The symbol for the adiabatic ratio is g (gamma) and equal to 1.667 for all monoatomic ideal gases like He, Ar, Ne. Unless exceeding 10 Bar, the use pressure many commonly used process gasses can be treated as being ideal which means that individual molecules and atoms do not feel any significant bond-energy from other molecules or atoms in the same gas. The specific heat changes as shown below with the number of atoms in a molecule of a gas. For diatomic gases, the Cp, Cv, and g are 3.5Ru, 2.5Ru and 1.4 respectively. Note how the distribution of energy to the various rotational modes for diatomic gases over monoatomic gases has added 0.5Ru per mode, to the gas specific-heat capacity. This is a consequence of the equipartion theorem. So far we have only assumed that the gasses are at a low temperature where the vibrational mode has not yet been accessed. A vibrational mode contributes twice as much to the heat capacity as a translational mode, but only if it is accessible. When vibrational modes are included e.g. in a solid the calculation of specific is not simple. In a solid, the frequencies of the vibration (vibronic modes) span a range. At the lower temperatures only the low frequency modes are available to take up heat. For condensed matter the experimental heat capacity is noted to approach a limit of 3Ru= 24.9 J/mol.K for simple substances like simple metallic materials. For molecular or ordered solids it will be more e.g ~ 6Ru= 49.884 J/mol.K for dimolecular solids. When this happens one may infer that all of the vibrational mode possibilities are activel (for taking up the energy). For solids and liquids the two specific heats (Cp and Cv) are almost equal (aluminum is 24.2 J/mol.K, titanium is 26 J/mol.K, Iron is 25.1 J/mol.K). For ideal gases, the specific-heat of the gas is independent of temperature. Note that many of the specific heat values measured or calculated for polyatomic atomic configurations are temperature dependent. The evidence regarding the behavior of vibrational energy in periodic (orderly) solids is that the collective vibrational modes can accept energy only in discrete amounts, and these quanta of energy are labeled phonons (lattice vibration states).. Like the photons of electromagnetic energy, the phonons obey Bose Einstein statistics. At very low temperature only the specific contributions from electrons is important and so the Fermi Dirac statistics apply. As an approximation the dependence of the specific heat with temperature in Kelvin, is T^3 (for condensed matter) at very low temperatures. The specific heat dependence is linear at higher temperatures prior to reaching a limit when all the vibrational states are fully active (and there is no further dependence on temperature). If a phase change should occur, the specific heat is not defined at the phase change temperature. Cp= Cv+Ru. Ru is 8.314 J/mol.K (universal constant) for all substances when expressed in the units J/mol.K. The material specific gas constant R, however when expressed in the units of kJ/kg.K is dependent on the materials. R is equal to Ru/M where M is the molecular weight in moles/kg. R, the gas constant expressed in units of kJ/kg.K for common gases is given below. At high temperatures and one atmospheric pressure most process gaseses can be considered close to ideal. In the units kJ/kg.K the gas specific heat capacity @ 300K is given below. If the gas is trully ideal then the Specific Heat Capacity is temperature independent. Steam Cp=1.8723 kJ/kg.K Cv=1.4108 kJ/kg.K - see steam tables. At IUPAC standard temperature and pressure (0 °C and 101.325 kPa), dry air has a density of 1.2754 kg/m3. At 20 °C and 101.325 kPa, dry air has a density of 1.2041 kg/m3 i.e.at 70 °F and 14.696 psia, dry air has a density of 0.074887lbm/ft3. Both energy and enthalpy are measured from a base temperature. Therefore only a change in properties of this kind is measurable. The change in enthalpy (H) is DH = Mass. Cp. (Change in temperature in Kelvin). The Enthalpy per kg (or specific enthalpy) is given the symbol h. Thechange in internal energy (U) is DU = Mass. Cv. (Change in temperature in Kelvin). The Internal Energy per kg (or specific internal energy) is given the symbol u. The table below gives Enthalpy per kg (h) and Energy per kg (u), and Density of Air, at various temperatures achieved by the Airtorch™. Base ~ 0K. Please note the above are approximations and should be verified from standard texts prior to use. Unintended typographical errors are possible. Other important properties of a gas are the dynamic-viscosity (defined below), kinematic-viscisity and Prandelt number (defined below). For an ideal gas these are independent of temperature. The Prandtl Number is often used in heat transfer and free and forced convection calculations. It depends on the fluid properties. The Pr ranges from 0.7 - 1.0 for common process gasses, and Pr ranges from 0.001 - 0.03 for simple liquid metals. For polar liquids like water and oils the Pr ranges from 1 - 2200 (the lower-end being for water and the higher-end for high molecular weight viscous oils). The Prandtl Number is a dimensionless number which is the ratio of momentum diffusivity (kinematic viscosity) and thermal diffusivity. This number may as you imagine give a sense of comparion of viscous and thermal forces required for an objective, as well as indicate what carries shear force to what carrier the thermal (heat) trasport in a molecular sense! μ = absolute or dynamic viscosity (kg/m s). The dynamic ( or absolute) viscosity is the tangential force per unit area required to move one horizontal plane of a fluid with respect to the other at unit velocity when maintained a unit distance apart. 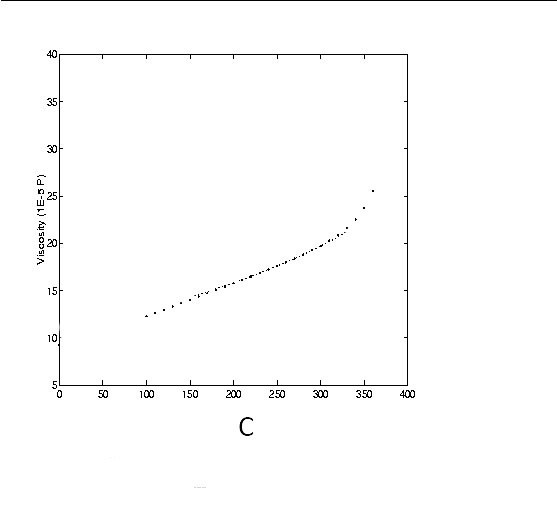 v = kinemayic viscosity or momentum diffusivity (m2/s). Kinematic Viscosity is the ratio of absolute or dynamic viscosity to density. Kinematic viscosity can be obtained by dividing the absolute viscosity of a fluid with density. Pr = Prandtl's number. (Note dimensionless). In a closed container partly filled with water there will be some water vapor in the space above the water. The concentration of water vapor depends only on the temperature. It is not dependent on the amount of water and is only very slightly influenced by the pressure of air in the container. The water vapor exerts a pressure on the walls of the container. The empirical equations given below give a good approximation to the saturation water vapor pressure at temperatures within the limits of the earth's climate. The pascal is the SI unit of pressure = newtons / m2. Atmospheric pressure is about 100,000 Pa (standard atmospheric pressure is defined as 101,300 Pa). The Relative Humidity (RH) is the ratio of the actual water vapor pressure to the saturation water vapor pressure at the prevailing temperature. RH is usually expressed as a percentage rather than as a fraction. The RH is a ratio. It does not define the water content of the air unless the temperature is given. The reason RH is so much used in conservation is that most organic materials have an equilibrium water content that is mainly determined by the RH and is only slightly influenced by temperature. Notice that air is not involved in the definition of RH. Airless space can have a RH. Air is the transporter of water vapor in the atmosphere and in air conditioning systems, so the phrase "RH of the air" is commonly used, and only occasionally misleading. The independence of RH from atmospheric pressure is not important on the ground, but it does have some relevance to calculations concerning air transport of works of art and conservation by freeze drying. This calculation is often used to judge the probability of condensation on windows and within walls and roofs of humidified buildings. It is sometimes convenient to quote water vapor concentration as kg/kg of dry air. This is used in air conditioning calculations and is quoted on psychrometric charts. The following calculations for water vapor concentration in air apply at ground level. The heat content, usually called the enthalpy, of air rises with increasing water content. This hidden heat, called latent heat by air conditioning engineers, has to be supplied or removed in order to change the relative humidity of air, even at a constant temperature. This is relevant to conservators. The transfer of heat from an air stream to a wet surface, which releases water vapor to the air stream at the same time as it cools it, is the basis for psychrometry and many other microclimatic phenomena. Control of heat transfer can be used to control the drying and wetting of materials during conservation treatment. The enthalpy of liquid water is also sometimes defined to be zero at zero degrees Celsius. To turn liquid water to vapor at the same temperature requires a very considerable amount of heat energy: 2501 kJ/kg at 0C. Notice that water vapor, once generated, also requires more heat than dry air to raise its temperature further: 1.84 kJ/kg.C against about 1 kJ/kg.C for dry air. The final formula in this collection is the psychrometric equation. The psychrometer is the nearest to an absolute method of measuring RH that the conservator ever needs. It is more reliable than electronic devices, because it depends on the calibration of thermometers or temperature sensors, which are much more reliable than electrical RH sensors. The only limitation to the psychrometer is that it is difficult to use in confined spaces (not because it needs to be whirled around but because it releases water vapor). Unsaturated air evaporates water from the wet wick. The heat required to evaporate the water into the air stream is taken from the air stream, which cools in contact with the wet surface, thus cooling the thermometer beneath it. An equilibrium wet surface temperature is reached which is very roughly half way between ambient temperature and dew point temperature. B is a constant, whose numerical value can be derived theoretically by some rather complicated physics (see the reference below). The relative humidity (as already defined) is the ratio of pa, the actual water vapor pressure of the air, to ps, the saturation water vapor pressure at ambient temperature. The psychrometric constant is taken from: R.G.Wylie & T. Lalas, "Accurate psychrometer coefficients for wet and ice covered cylinders in laminar transverse air streams", in Moisture and Humidity 1985, published by the Instrument Society of America, pp 37 - 56. These values are slightly lower than those in general use. There are tables and slide rules for calculating RH from the psychrometer but a programmable calculator is very handy for this job. Alternatively, click to calculator. Psychrometric charts have graphical versions that can be emailed to you.